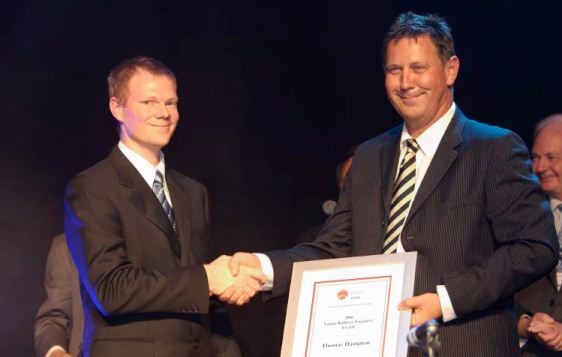 THE YOUNG RAILWAY ENGINEER AWARD IS MADE TO ENCOURAGE AND REWARD PROFESSIONAL ENGINEERS, TECHNOLOGISTS OR ASSOCIATES IN AUSTRALIA AND NEW ZEALAND WHO ARE UNDER THE AGE OF THIRTY. In 2006, two awards have been made to Miss Rebecca Bignell and Mr. Tom Hampton. Mr. Hampton presently is a Project Manager with John Holland Rail, working with the John Holland/Barclay Mowlem/Kellog Brown and Root Joint Venture which, through a contractual arrangement with Freight Link, is responsible for the maintenance and various capital/renewal works on the Tarcoola to Darwin Railway. He holds a Bachelor of Engineering (Civil) (Hons) degree, being top of his graduating class. He is also the secretary of the SA/NT Chapter of the RTSA. Miss Bignell is a Signals Engineer working in the Network and Infrastructure Division of the Public Transport Authority of Western Australia and recently has been engaged on the signaling design, installation and commissioning of the new Train Control System. She graduated from the Curtin University of Technology as a Bachelor of Engineering Mechanical and, on her own initiative, is studying for a Masters Degree in Electrical Engineering. Additionally, Miss Bignell has passed three out of the four modules required for acceptance as a professional member of the Institution of Railway Signal Engineers.